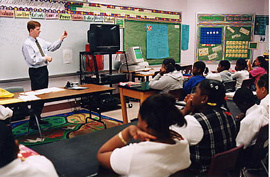 A teacher teaches a lesson in front of a classroom. Photo Courtesy of United States Census Bureau. Photo by Lloyd Wolf for U.S. Census Bureau. Most American junior and senior high schools use a two-semester system. Some courses are taught for two semesters and other courses last only one semester. The fall semester begins at the end of August. The spring semester runs from January to June. But many schools are changing to block scheduling for classes. These schools use a quarter system instead of a semester system. In a school using the semester system, there may be 6 to 8 class periods in one day, with each period lasting forty minutes. So students study many different subjects in one semester. In block scheduling, students might have only 4 class periods in a day, but each period is ninety minutes long. So students cannot take more than three or four courses. No matter what kind of schedule a school uses, students need a certain number of credits to graduate from high school. Each course is worth a specific number of credits. For example, students usually earn one credit for a year-long course in algebra. Most students in the United States need a minimum of 22 credits to graduate. Over four years, this means students must take about five courses a year, and pass them, in order to graduate.